Industrial Building In the planning of industrial buildings, alongside corporate design and functional aspects, flexibility and the interrelationship between research, development and manufacturing processes are becoming ever more important. The projects included in this issue range from a hall for manufacturing cars to a works for pharmaceutical technology and a modern vineyard facility. What’s more, the entire range of structural materials is to be found in the examples, from steel, concrete and timber to something that may be regarded as exotic in many parts of the world ­today, namely earth. With the use of this substance, the Ricola herbal centre near Basle seeks to demonstrate its closeness to the site and its environmental awareness. The McLaren Production Centre near London, on the ­other hand, with a space distinguished by the use of ­ceramic tiles, has more in common with a laboratory than a classical, industrial automobile works, precisely reflecting the elaborate production methods of this sports-car manufacturer. www.detail.de Barkow Leibinger is one of the few architectural practices that owes its international reputation largely to industrial buildings. The range of activities in which Frank Barkow and Regine Leibinger are involved – together with a staff of 50 at present – extends from experimental studies in materials for exhibitions like the Venice Biennale of ­Architecture to “soft master planning” in the development of industrial sites and urban districts. DETAIL: In recent times, your office has gained attention with high-rise buildings: the Estrel Tower, for example, will be the tallest structure in Berlin. components in Kaufbeuren, where thousands of cars drive past every day. DETAIL: Does that mean that industrial building is a rather thankless task for an architect’s career? What other projects do you have in Berlin? Frank Barkow: In 2013, we completed a garden pavilion on Wannsee and last year, the Aufbau Haus 84, a studio building for creative trades in Moritzplatz. Two office developments near the main station have reached the carcass-structure stage, and the Estrel complex in Neukölln, with a 175-metre-high hotel tower, is in the course of planning. DETAIL: What is it about high-rise buildings that particularly attracts you? Frank Barkow: In industrial construction, we’ve been able to implement almost all the concepts and architectural ideas we have developed over the years. It’s therefore quite refreshing to be able to do something completely different for once. What’s more, slender towers are a complementary form to low-rise halls. But to be quite honest, with high-rise construction, the design latitude ­internally is very limited. We therefore try to enter into a dialogue with the urban fabric by using exciting cubic forms and three-­ dimensional, sculpturally planned facades. We are still confronted with challenges in the form of industrial developments, of course, and it would be foolish to neglect those areas of construction where we have the greatest amount of experience and expertise to offer. DETAIL: You also undertake the planning of large industrial areas. What is your philosophy in this respect? DETAIL: With the high quality of your buildings, you have made industrial construction “respected” again in architectural circles. Is there an increased demand for structures of greater quality? Regine Leibinger: We register a marked growth of interest among clients in particular. We notice this in the fact that architectural competitions are increasingly being held in this field. That applies especially to medium-size undertakings – inventive leaders on the world market who may often be less well known publicly, yet of whom there are a lot in this country. That means potentially more contracts for us, but also more competition in a field that our colleagues tended to neglect in the past. But we are neither the first nor the only ones to have given industrial building its rightful place in architecture again. The Vitra development in Weil am Rhein, for example, has caused a much greater stir than our projects. DETAIL: Why is that? Regine Leibinger: Since the 1980s, Rolf Fehlbaum, the head of Vitra, has been ­clever enough to gain the support of worldfamous architects for his production halls. Regine Leibinger: We have formulated a concept of “soft master planning” for this, which means not drawing up a far too rigid set of rules and trying to fix things that will take place in the distant future – things that really can’t be foreseen. Good master planning should be able to respond to the development of a concern. It should be able to react to rapid growth, but it will not be incomplete if the individual steps take longer than foreseen. It should be able to adapt when technologies change or completely new needs arise. To achieve this, you have to work your way very deeply into the production processes and really understand the company. We love this kind of dialogue. an acoustic dimension that varies depending on the requirements of its function. The handbook conveys practical and experienced knowledge of acoustical engineering to all expert planners, architects as well as to interested building contractors. In doing so, the manual raises your awareness of how specific acoustic considerations can contribute to the success of a project. Favourable proportions for rectangular rooms require room dimensions that are as dissimilar as possible, e.g. ratios of 1:0.83:0.47 or 1:0.79:0.62. Placing one or more room surfaces at an angle, dividing up large areas of the wall surfaces or using absorbent materials are suitable methods for suppressing disturbing room resonances. Such aspects are particularly important for the recording and listening rooms of studios, but also in classrooms for music. These considerations also play a role in small, possibly glazed, offices. The physical effects can be predicted with more accuracy by using finite element or boundary element methods, for example, where the sound is modelled according to its wave nature. For large rooms, such methods are only suitable for low frequencies at best owing to the computing time required. Measurements of room acoustics are generally carried out with the help of special measuring loudspeakers. Microphones or possibly a dummy head (p. 11) are used as receivers. The number of measuring positions (transmitters and receivers) varies with the size of the room and lies between about six positions in rooms of classroom size up to more than 100 in concert halls and opera houses. The duration of the measurements varies correspondingly, from 30 minutes to whole days (or nights). The measurements are mostly carried out in unoccupied rooms and the results converted to the occupied condition. Measurements in venues are occasionally carried out in the occupied condition, e. g. directly prior to a performance, with fewer measuring points (duration about 5 – 10 min). Room acoustics measurements An objective room acoustics quality assessment, or a report on the current situation, is necessary to check both design and construction, in advance of planned refurbishment work, or in the event of complaints. Whereas in the past a blank cartridge fired from a gun or bursting balloons were the methods often used, these days synthetic measurement signals that can cover the entire range of audible frequencies are used. In this way, room impulse responses can be determined quickly and accurately, allowing the reflections structure and objective room acoustics criteria to be evaluated. It is also possible to track down acoustic defects with the help of intelligent measuring techniques. If only the frequency-related reverberation time is required, the decay process of noise signals after switching off can be evaluated. sound is emulated properly in physical terms. Owing to the different pros and cons of measurements on models and computer simulations, both methods are sometimes used together for particularly demanding room acoustics tasks (concert halls, opera houses). Sound absorption of architectural surfaces Many of the surfaces preferred by architects these days, e.g. glass, fair-face concrete, plaster, reflect sound. It is therefore frequently necessary to incorporate sound-absorbent materials into the interior design. Industrially manufactured products, custom-designed surfaces and multi-layer constructions are all potential options. All kinds of sound-absorbent systems are available, from mineral-fibre insulating boards, laid, for example, in suspended ceiling systems, to special products such as microperforated foils. The materials differ not only in terms of appearance and price, but also in their acoustic efficiency, i.e. the sound absorption coefficient. Measuring sound absorption in a reverberation room Sound-absorbent linings and materials are identified by the sound absorption coefficient for omnidirectional sound incidence. 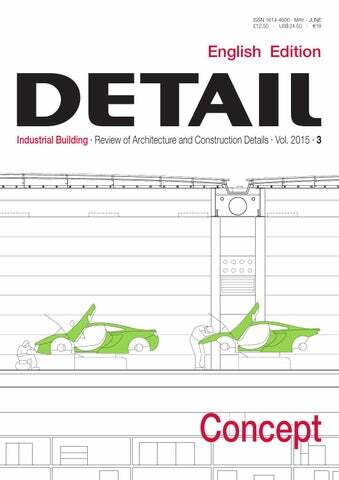 Typical values for many architectural surfaces can be found in the relevant publications. For acoustic products, the sound absorption coefficients are listed in their technical specifications. Most of the data is based on measurements carried out in a testing laboratory to DIN EN ISO 354. According to this international standard, the construction to be tested – an area of 10 –12 m2 – is set up properly in a so-called reverberation room (Fig. 1a). After measuring the frequency-related reverberation times with and without the construction, the Sabine reverberation equation can be used to determine the sound absorption coefficient _S, which is specified in one-third octave bands from 100 to 5000 Hz. Examples of wall linings that scatter the sound: a Bruneck Grammar School, Southern Tyrol b Refurbishment of Teatro Reggio, Turin Sala Santa Cecilia, Parco della Musica, Rome, 2002, Renzo Piano Building Workshop a Computer model for acoustic purposes: the room acoustics computer simulations help to provide more accurate forecasts of the acoustic propagation quality that can be expected. b Model built for acoustic tests (scale 1:20), shown here opened; the audience is resented by soft profiled acoustic foam Soundwaves are reflected in various directions from structured surfaces; schematic drawing of a lining with a sawtooth structure. a Low frequencies ignore the structure if the wavelength is large compared to the dimensions of the structure; the sound energy is reflected geometrically with respect to the dotted red line. b Medium frequencies are scattered more or less evenly in different directions. c High frequencies are reflected geometrically from the individual surfaces (dotted blue line) because here the dimensions of the sawtoothstructure are large compared to the wave2b lengths. Frei Otto – a Life of Research, Construction and Inspiration Irene Meissner, Eberhard Möller Institut für Internationale ArchitekturDokumentation, Munich May 2015, 128 pp., hardcover, German/English, ISBN 978-3-95553-252-9 €34; £27; US$48 No other architect provided as many ideas and inspiration to construction in the second half of the 20th century as Frei Otto. Lord Norman Foster described this great pioneer of lightweight construction simply as “an inspiration”. Frei Otto explored the foundations of resource and energy-efficient building well before these issues received the attention of the wider public. By including users in construction planning and taking into account local and climatic conditions, he was able to open new avenues for the building industry. The publication provides insights on the key aspects of his work. At its heart was the search for natural designs and an exploration of form-finding and selfdevelopment processes. As such he created a whole universe of ideas using membrane, net and convertible roofs with umbrellas, gridshells, and pneumatic structures. The book introduces his key works and highlights how his ideas were adopted and disseminated throughout the world. It is a depiction of some of his most important works: from the pavilion in Montreal to the Munich Olympic roofscape and the Berlin eco-houses. We learn about new forms of lightweight and natural, adaptable and modifiable construction and gain insight into interdisciplinary research projects. Frei Otto’s work is a source of inspiration for architects and engineers worldwide. This catalogue was intended to coincide with the German architect’s 90th birthday, but has instead been published shortly after his death. Frei Otto passed away on March 9, 2015. He will receive the Pritzker Architecture Prize, considered the most prestigious international award in architecture, posthumously. individual functions lined up next to each other. From the foyer, one proceeds through the hall with the fermentation tanks into the area for technical processing and finally, via an atrium, to a seminar space. The lower storey, articulated by rows of columns, contains the storage areas for the barriques and the wine bottles. Walls consisting of unplastered brickwork, inspired by Arabian mashrabiyas, ensure a natural ventilation of the barrels. In contrast, the ground floor is free of columns. The load of the roof is borne by six vertical concrete slabs. The use of oak and exposed concrete is also a reminiscence of the wine barrels and the concrete tanks in the Cheval Blanc cellars. This production building in Woking, a city within commuting distance to London, is characterized neither by roaring machines, frantically ­rotating high-tech robots, nor an unsightly industrial atmosphere, but by serenity and a deliberate quest for unified design. Each year the employees of the race car manufacturer McLaren Automotive assemble up to 4000 vehicles here by hand – in a setting that more closely resembles a laboratory than a car factory. Built-ins extend no more than 1.60 m above the floor, white surfaces and open or generously glazed work areas (even in the paint shop) provide working conditions in which the employees are continually in contact with each other. Concealed pipes, cables and ducts with a variety of connection options for the required equipment make it possible to flexibly arrange the production area. The focus is directed to an equal degree to the individual, the product, and the building: this has to do with the fact that McLaren Production Centre serves not only as production site, but also as marketing instrument with which the company’s high art of engineering and craftsmanship is to be communicated to visitors. That this occurs in a matter-of-fact and – true to England – discreet manner is illustrated by the building’s immediate surroundings: the expansive, unspoilt landscape is free of fences and “no entry” signs. sible to design and – relatively cost-efficiently – build the McLaren Production ­Centre in only twenty months. First of all, the Foster + Partners were guided by the architectural vocabulary, as well as the standard details, of the MTC: for example, the glazed railings, the wall cladding, and the circumferential cantilevering roof. Second, not only were to a great degree the same designers involved in both projects, but also the same firms. Last but not least, it was the unwavering quest of both the architecture firm and client for clear, simple, efficient solutions that made it possible to realize such a highly functional building. mobile manufacturers – are all quite similar. Nevertheless, our goal is to create special emotions here, extraordinary aesthetics, and a special “taste”. Regardless of whether the tours of the McLaren Production Centre are given to (potential) customers, politicians, or sponsors, afterwards they will all tell other people about the experience. If we are able to reach and inspire people, it will also become possible to influence how they feel and think about the brand. McLaren Automotive’s aim is to become the most important race car brand; we are aware that it will take more than just fast, beautiful cars to achieve that goal. Roland Pawlitschko conducted the interview with Alan Foster, operations director at McLaren Automotive since 2008, at the MPC in Woking. production hall, where on average a sports car is completed every 45 minutes. The surprise at the sheer scale of the 20,000 m2 hall is palpable and is reinforced by the fact that upon entering the campus, most visitors have no sense of how large the MPC is. At the MPC we give our customers the opportunity to watch their own cars being assembled or painted. The air pressure in the completely glazed paint boxes is raised slightly (a measure to keep out potentially impure air). Thanks to this measure, the customers may watch the paintwork in their normal clothing – as opposed to being required to wear special dust-free protective suits. Herzog & de Meuron and Ricola are a team that has enriched Swiss industrial culture with many a model structure. After an interval of 15 years, the two undertakings have now added a further chapter to their collaboration. The new Kräuterzentrum (herbal centre) on the ­outskirts of Laufen near Basle is probably the largest rammed-earth building in Europe to date. It is also an appropriate symbol of the ­entrepreneurial values of the clients: reliability, identity with native ­values and a consciousness of their responsibility towards the environment. At the same time, the structure, which the architects developed jointly with Martin Rauch, the Vorarlberg earth construction ­expert, is in one of the oldest forms of building in the world, here ­applied in an age of system construction and prefabrication. The outer walls consist of a total of 666 rammed-earth units, each weighing up to five tonnes. Their massive character may be surprising for an ­industrial development, but it ensures a relatively constant indoor ­climate throughout the year for the storage of the ingredients that the client, Ricola, traditionally uses to manufacture its famous “Swiss Kräuterzucker” herbal confectionery. Numerous details of the building skin are related to the physical properties of the construction material, from the unconventional circular form of the windows to the minimal roof projection, which is designed to protect the earth walls from erosion. Within the cubic volume, of course, the logic of linear operating sequences dominates, namely short routes and maximum flexibility. All this begins only a few milli­ metres behind the external walls, where the building is stabilized by a powerful reinforced concrete skeleton frame against wind loads and earth tremors. Pierre de Meuron was interviewed by Emilia Margaretha. position of the earth should be or how large the elements could be, we worked on a fullsize mock up. The danger with earth construction is that water can erode the material. A key question, therefore, was how to prevent the building being washed away by rain. For a structure with the dimensions of the herbal centre that was a fundamental ­issue, of course. DETAIL: How did you resolve this? de Meuron: Strips of trass-lime mortar were tamped into the wall elements to retard erosion. In this way, the water can be made to flow along the wall more slowly or to drip off. The 40 cm roof projection acts as an additional form of protection. DETAIL: How was your collaboration with the others who were involved in the project, especially in view of the initial situation: the fact that a structure of this kind had never been built here before? de Meuron: The task was a demanding one and challenging. It could only work, of course, if mutual respect existed between all the parties involved and the main goals were made clear. Only when all these aspects have been resolved can an object like the herbal centre in Laufen be created. Time and money both played a major role, too. Initially, the earth elements were to be fabricated in Vorarlberg, but then we rented an empty hall not far away and implemented the newly developed technology for the very first time – close to the site. DETAIL: Couldn’t the load-bearing construction have been made of earth, too? de Meuron: The dimensions of this building are enormous. Traditional earth structures in Africa or the American South-West are much smaller, and the roof is usually executed in a vaulted form. Like stone buildings, earth structures can bear only compression loads, not tensile ones. In the case of the herbal centre, we can define the facade as an outer skin, an enclosing wall in earth. And within it stands the production and storage building. BIT is the first designer radiator launched by Italian bathroom manufacturer Antoniolupi. Made of 100 % recycled aluminium, the monobloc radiator offers a high degree of flexibility in layout – the width of the element is always 45 cm but radiators can be placed side by side and there is a choice of six heights: 45, 60, 90, 120, 150 and 180 cm. In addition to its primary function of heating, it is intended to be looked upon as a furnishing element in its own right and is available in all the colours of the company’s product catalogue to tone or contrast with a scheme, whilst the slight rhythmic protrusions create a sculptural effect. The Opale range of slim, low-profile shower trays from Keramag Design, with a total installation height of just 130 mm, is available in eight sizes, and is designed to take advantage of the move towards larger trays, particularly as replacements for traditional bathtubs. With the flexibility of lay-on or inline floor installation, the trays meet EN 274 and suit a range of applications from hotel bathrooms to showering areas for wheelchair and less-able users. Duravit’s Vero range of bathroom ceramics has been complemented by a Red Dot Award-winning furniture collection, featuring balanced proportions with a strong design identity. Recurring material thicknesses and dimensions define the cubic look that characterises the range, whilst vertical handles inset into the fronts create a contrast. Finishes include the Ticino cherry wood decor shown here, as well as real wood veneers. Interiors are in diamond black, and the softclose drawers are available with a maple or walnut interior organiser system. Optional LED ambient lighting below the consoles accentuates the relaxed atmosphere that the wood surfaces bring to the bathroom. Designed to meet all heating requirements, the radiator comes in three types: water, electric and combined water/electric versions. It can be placed in a vertical or horizontal position � in the vertical option it can be supplied with the Bitbarra towel holder as seen below, in satin stainless steel or lacquered embossed in all the furniture colours. Alternatively, the radiator can be supplied with cut-outs for towels. Granite Transformations recently undertook the upgrading of the bathrooms and cloakroom in a four-bedroom property using its non-porous agglomerate finishes and Italian glass mosaics from Trend, for which the company is an approved stockist. The cloakroom, above, features White Star flooring and matching matt wall cladding, and Trend’s Liberty Onyx mosaic, with highlights of silver and steel, is applied up to waist height, complemented by a modern matt grey towel radiator. The Advance electric shower range from Mira has recently been enhanced with the addition of what is claimed to be the only shower on the market to offer wireless pairing to a waste water pump. The Advance Flex Extra Wireless is designed to simplify installing or retro-fitting a wet room in situations where a conventional gravity-fed drainage system would not be feasible, such as where level access is required. The Hergom Cares wood-burning oven from Eurostove, top, makes a stylish statement piece in the kitchen. As well as being highly efficient (80 % with an 11 kW output), this new oven features a porcelain enamel castiron front supported by a steel structure with a stainless-steel top frame and modern chrome bar handles. A ceramic-glass top plate provides medium heat, but when lifted gives access to a hotter cast-iron hotplate. There is also an optional warming drawer. Internally it is stainless steel with a removable chrome grid. Standard finish is black enamel with brown majolica as an option, and either would work well in a traditional kitchen or in a contemporary context. Mowlem & Co works closely with architects and designers to create bespoke kitchens tailored to individual briefs, some examples of which are seen here. Purity (top, centre and right) is a combination of white Parapan and light grey oak. The company says the key to a successful open-plan yet minimalist design is ample, clearly defined storage: from tall shelving for wine glasses to larder cupboards for dry goods, and customised solutions for pots, pans and crockery. CAD drawings All CAD drawings contained in the “Documentation” section of the journal were ­produced with . DETAIL English appears in 2015 on 15 January, 2 March, 4 May, 1 July, 1 September, 2 November. The publishers bear no responsibility for unsolicited manuscripts and ­photos. No part of DETAIL may be reprinted without permission from the publishers. No guarantee can be given for the ­completeness or correctness of the ­published contributions. No claims can be accepted for non-­delivery resulting from industrial disputes or where not caused by an omission on the part of the publishers. This journal is printed on chlorine-free bleached paper. The entire contents of DETAIL are ­protected by copyright. Any use of contributions in whole or in part (including drawings) is per­mitted solely within the terms of relevant copyright law and is subject to fee payment. Any contravention of these conditions will be subject to penalty as defined by copyright law.